It’s Time to Get Outside and Get Active! With summer officially upon us, we’ve all been enjoying the sun on our faces as much as we can, and dreaming of what our plans will be for those long awaited vacation days. Maybe I’ll take my family for a day of Treetop Trekking in the Ganaraska Forest? Or perhaps hike through one of nearly 300 conservation areas found across Ontario and track our Healthy Hikes family time? Better yet, maybe we’ll rent equipment through Green Canoe Outfitters and try out kayaking or stand up paddle boarding? Physical activity is a key component to summer fun, no matter what you choose to do. The Ganaraska Region Conservation Authority (GRCA) suggests that people of all ages take the time to be active this summer. Keep your children busy with physical activities, and lead by example with hikes, swimming, and other outdoor adventures. Register your wee one into a summer camp or get them that fishing rod that they’ve been eager to try out…anything to keep your family on the go! There are numerous summer activities available within our community. The GRCA’s Nature Nuts Summer Camp offers themed weeks of fun-filled activities where children who love the outdoors will explore the wilderness through scavenger hunts, environmental games, creative crafts, and so much more. Back by popular demand this month is Survival Week #2 where campers will learn wilderness survival skills, including tracking, gathering food, and building shelters. Consider venturing about in the GRCA’s 11,000 acre multi-use Ganaraska Forest. The central section of forest features a series of well-marked looped trails that range in length from 4 to 16 kilometres. 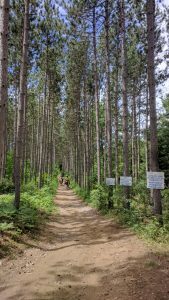 These passive use trails are very popular for hiking, horseback riding and mountain biking. If you’re looking for a motorized activity for the family, check out Trail Tours Dirt Bike and ATV School. Spend a day on arguably the best system of trails for off-road motorcycles and ATVs in southern Ontario. The west and east sections of the forest feature a vast system of trails and forest roads for off-road vehicle use, including plenty of technical single-track trail for more advanced dirt bike riders. Whatever your interests are in trail-based outdoor recreation, the Ganaraska Forest provides a close to home experience that you’re sure to enjoy. The GRCA also offers the OFAH Tackleshare program. The loaner site, located at the GRCA office on Hwy 28, provides fishing rods, stocked tackle boxes, educational material, and Young Angler Licenses – encouraging people of all ages to get out and get active!